Eagles offensive tackle Jason Peters preparing to block Cowboys defensive end Randy Gregory in January 2017. Good morning. The Eagles will practice at 1 p.m. today for Sunday night's game against the Dallas Cowboys. The players will meet with reporters after practice. Jalen Mills and Sidney Jones are likely to continue missing practice, but pay attention to whether Lane Johnson and Darren Sproles continue to progress. Both are expected to play Sunday. The Eagles’ Jordan Hicks, center, after he intercepted a pass in the end zone against Dallas in October 2016. 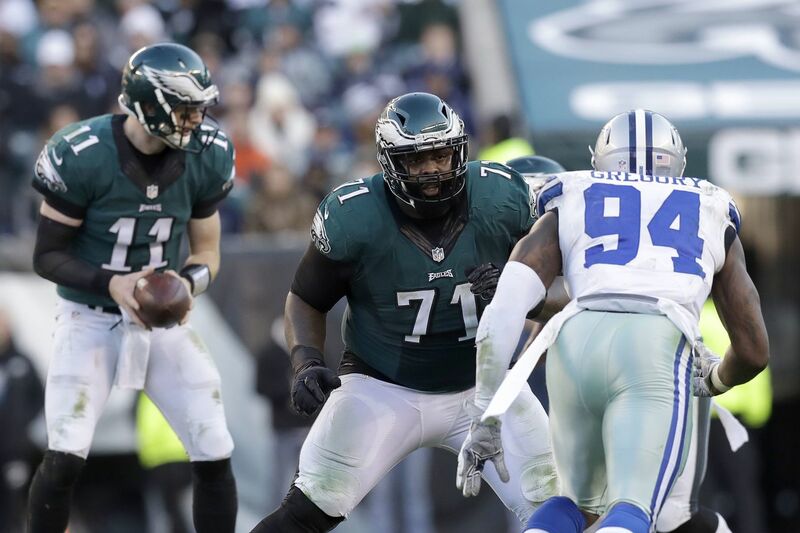 Eagles left tackle Jason Peters, who makes his offseason home in Texas, hears from Cowboys fans often. After the Super Bowl, Peters heard that the Eagles were "lucky." "They're not having [luck] down there!" Peters responded. The Eagles are shown old Eagles-Cowboys clips leading up to this game, too. Washington and the Giants are also big rivals, but the Cowboys had the largest profile while many of these players were children. The Eagles enter this game healthier than they've been, too, and they know their path to the playoffs is by winning the division. Washington is ahead of the Eagles right now, but the Eagles have a chance to take a two-game lead over the Cowboys in the NFC East with a win Sunday. "It's an exciting rivalry," coach Doug Pederson said. "It's two really great franchises, obviously, great teams. It's always exciting, Dallas week. There's a lot of energy. It's an NFC East opponent, something that we talk about all the time. I go back to my days when I was here as a player, obviously, and playing the Cowboys and what it meant to obviously this city and our fans. So, I expect all our fans to be rocking the Linc Sunday night." Can Jordan Mailata carry the ball? One fascination fans have had since the Eagles drafted Jordan Mailata is whether the former rugby player can be used as a situational rusher. Mailata is learning how to play the offensive line and he's usually a healthy scratch for the Eagles, but the 6-foot-8, 346-pound Australian has carried a ball before. And though it's not something the Eagles have immediate plans to do, Pederson did not rule it out. "It's a good question," Pederson said. "I don't know. He's definitely used to carrying a larger football. I don't know what they call it, that ball [in rugby]. Very athletic guy. It's intriguing. I mean, it's not out of the question." By the way, if you missed Mike Jensen's story on Mailata's journey from rugby to the NFL, it's worth reading. If it seems you must wait all day to watch the Eagles-Cowboys game every season, it's because you do. This weekend marks the 10th consecutive season the Eagles and Cowboys play Sunday Night Football. That's the longest streak for any matchup on the broadcast prime-time package in NFL history, according to NBC. In fact, this will be the 12th time the two teams meet since 2006 when Sunday Night Football went to NBC. That ties the Giants and Cowboys for the most-played matchup on the network. The Eagles have won six of those 11 meetings. Two of the last three went to overtime. The last time they played at Lincoln Financial Field on a Sunday night was 2014. The Cowboys won that night, 38-27. It sounds like the Eagles will wear their black uniforms for the game this weekend. Zach Ertz reached in vain for a pass in the end zone against the Raiders last Christmas Day. The Eagles returned from the bye with a healthier roster, including Darren Sproles' return to practice. Look for Lane Johnson to play on Sunday, Paul Domowitch writes. A few players ripped Dallas and the Cowboys, Marcus Hayes writes. New cornerback Cre'von LeBlanc is trying to learn the playbook, Les Bowen writes. Jeff McLane broke down the film to show how Golden Tate will fit. What was on the minds of Eagles fans on Wednesday? McLane and I discuss the latest Eagles news in the Birds' Eye View podcast. Who do you think will benefit the most on the Eagles offense from the addition of Tate? Good question, because we've already addressed in this space whose playing time will be affected most by the addition of Golden Tate. This is the other end of the spectrum. Carson Wentz will benefit the most by Golden Tate's joining the team. Tate is a tough, reliable wide receiver who will help on third downs and in the short-passing game, allowing Wentz to throw the ball more quickly and stay upright. "I think that he's quarterback-friendly in terms of his body language," offensive coordinator Mike Groh said of Tate. "He and Matthew Stafford played a lot of ball together, and before that with Russell Wilson, those guys were able to figure out his body language at the top of routes. He's got really good short area quickness, so he can set guys up, keep guys off balance, and like we've talked about already today, he can break tackles when he needs to. He's got good play strength, lower-body strength to be able to plant and run through some arm tackles." Wentz already had good numbers this season, with a notable increase in completion percentage. Look for that to continue to rise with the addition of Tate.